Ideal for glass, plywood, or metal sheets. Application: Customer was looking for simple battery powered unit to handle 1,000 pound (453 kg) glass windows. 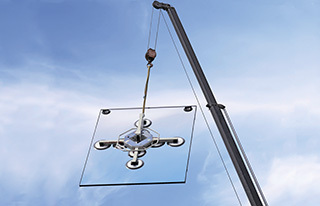 Problem: The customer was having trouble quickly slinging large pieces of glass underneath a mobile crane for installing glass windows onto a building. Customer was looking for a quicker way to install the glass with less potential scratching of the glass. Solution: We were able to provide a cost efficient battery powered window manipulator unit that could attach to a mobile crane. This allowed the customer to more efficiently handle glass, and they were able to use them for installations all over the country. Result: Using the VacuMaster Glass vacuum lifter, workpieces can be swiveled manually 90 degrees and rotated 360 degrees. These movements can be locked in place in 18 degree increments for swiveling and in 45 degree increments for rotating. This means that the workpieces can be aligned perfectly and then installed in the facade. 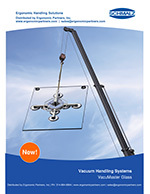 The VacuMaster Glass lifting device can be operated without being attached to the electrical power supply. An LED indicator shows the charge status of the 12 volt rechargeable battery, which can also be replaced. In addition, the controlled vacuum pump assures that the VacuMaster Glass can remain ready for operation for eight hours.